Principal vs. Principle: Why Confusing? Principal vs. Principle: What's the Difference? Have you ever felt confused when someone says words with the pronunciation /prɪnsəpəl/ in it? 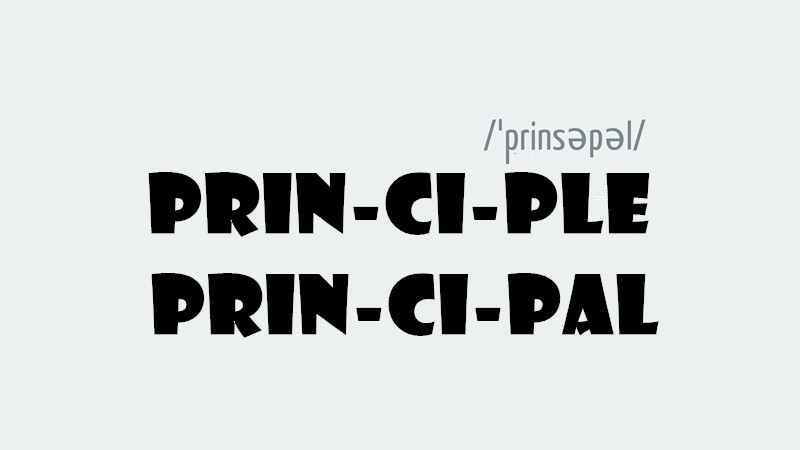 Were you confused if they meant to say either the word "principal" or "principle"? Actually, this is not that hard thing if you know these two words are very different from each other in many ways. Even though the words sound the same, they are neither spelled the same, nor do they mean the same thing. Learn the differences of these two words and the usage of them in correctly here! can make sure which word is correct when both words sound the exact same. If you meet a native English gentleman, it may be a little easy to figure out which word he is saying since in the UK, people always pronounce principal /prɪnsəpəl/ and principle /prɪnsɪpəl/. However, in the US, people tend to speak these two words with the same pronunciation /prɪnsəpəl/. Then you need to connect the word to the context that is used to figure out which word the speaker actually means. The principal ingredient is the sauce. Your principal investment in the real estate has been rewarded. Mr. Lee has been the principal of the high school for two years. The interest on a loan cannot be deducted from the principal in advance. You are the principal to all the trade for me in this case. Kim is a boy of good moral principles that I have known. The principles of the Christianity include concerns for the poor, faith in the god, etc.